The UK success of Bluebird's low-floor accessible minibus – the Orion Plus – is about to be extended to Australia, appearing at the Bus + Coach show at Homebush in September. After the show, the 22 seater low-floor bus will be used as a demonstration vehicle at Bluebird's agent, Kingston Tours, operated by bus industry identity Don Imrie. There are currently 196 Bluebird Orion Vehicles on the road in the UK. 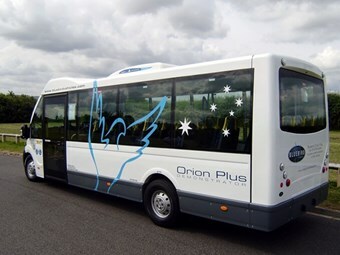 The Orion Plus was launched in 2011 as an extension to the company's range of low-floor accessible vehicles. The minibus sells in the UK market to schools, health and council services. Imrie is excited about the vehicle’s potential. "Australia is a vast country with no low-floor vehicle under 11 metres sold here at the moment," he says. "The school bus market is ideal for the Orion Plus, and 400 school buses operate in Victoria alone, transporting 7,500 special needs children so the potential is massive. "The main difference to the UK is the climate. We've boosted the heating by using the eberspacer E900 air heater and added a roof mounted Spheros CC145 climate unit for air conditioning." The Australian Bus + Coach show runs from September 25-26 at the Sydney showground and will be attended by Bluebird's managing director Rob Miller. Miller says Australia is just one growth area for Bluebird. "Other right-hand drive countries are also showing an interest in our products," he says. "Our reputation for build quality and the fact we manufacture a niche product means we have an exciting growth period ahead of us – with a real international flavour."